The strike that would have seen more than 300 workers at Vancouver International Airport walk off the job has been averted, the Public Service Alliance of Canada says. Shortly after 9:30 p.m. PT Thursday, an agreement was reached in last-minute contract talks between the union and the Vancouver Airport Authority, union spokesman Dave Clark said. "After a marathon mediation, a tentative agreement was done that's a fair deal for the employer, the YVR airport authority, and a fair deal for the employees," he said. Clark said details of the agreement will only be released once all union members have a chance to see them. "This is quite new news, we've been working hard," said Anne Murray, spokeswoman for the Vancouver Airport Authority. "The negotiating team has been working quite hard over the last couple of days, but it has been months of negotiations." The unionized employees work in areas such as emergency response, international arrivals customer care, passenger loading, runway maintenance and lighting, and administration. On Tuesday, the union issued a 72-hour strike notice and warned passengers to contact the airport or airlines and plan for delays and other potential disruptions in the event of job action. The strike notice came just weeks after 83 per cent of the membership of the Union of Canadian Transportation Employees members voted in favour of a strike. A union spokesman said flexible shifts and protection from contracting were two of the main issues needing renegotiation. The B.C. 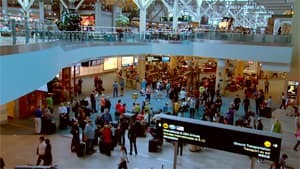 Federation of Labour had warned on Wednesday that air travel into or out of Vancouver could be "chaos" Friday morning if a strike did go ahead; however, an airport spokesperson said repeatedly that the airport would be fully operational even if the strike occurred.